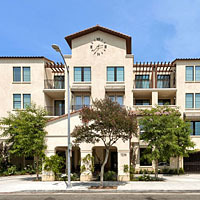 Canby Woods is a 98-unit, tax credit community located in Reseda, CA for people 55 and over. The waiting list is currently closed. The one and two bedroom units include wall-to-wall carpeting and vinyl flooring, window blinds, a private patio or balcony, and a kitchen with a range and oven, refrigerator, and waste disposal. Canby Woods residents enjoy access to a community room with a full kitchen, fitness center, computer lab, television room, library and outdoor spa. The community features on-site management and maintenance staff. Resident activities are regularly scheduled and are determined based on the community’s needs. Canby Woods is a LEED for Homes Gold project. Several sustainable features of the building are listed below. The site of the building is a previously developed infill lot, in an environmentally sensible location with existing municipal services. Residents have access to 14 basic community services within ½ mile of the building. The project is a high density development with at least 20 living units per acre of land. The landscape is designed to reduce irrigation demand by 20% and uses 0% turf. The trees and plantings provide shade for 50% of hardscapes, which helps to prevent the urban heat island effect. The lot is designed to manage runoff from the building’s roof and a high efficiency irrigation system with a precipitation sensor is used. The building uses water-efficient clothes washers, lavatory faucets, shower heads, toilets and Energy Star refrigerators and dishwashers. Highly efficient lighting is used throughout the project and the building’s air conditioning systems use environmentally-friendly refrigerants. Low emissions carpet, paints, sealants, adhesives, and insulation are used to promote healthy indoor air quality.